For more information refer to DCU's VISA Credit Card Agreement and Federal Truth-in-Lending Disclosure Statement. Apple, and Apple Pay are trademarks of Apple Inc., registered in the U.S. and other countries. Google and Google Pay are trademarks of Google Inc.
Samsung, and Samsung Pay are registered trademarks of Samsung Electronics Co., Ltd. I applied for this card because I needed to help my credit score. It is an excellent way to learn how to use a credit card. Unlike most secured credit cards on the market, DCU's Visa Platinum Secured Credit Card is a great value. You get all of the benefits of DCU's Visa Platinum Credit Card listed below as well as dividends on the savings you borrow against. If you are looking to establish or improve your credit history, this program is a great way to get started. Low Rates – Save over other secured credit card rates. No Annual Fee – Save up to $45 over other credit cards. No Fee or Higher Rate for Balance Transfers – Balance transfers from other credit cards to your DCU Visa Platinum Secured Credit Card are free. You can also make transfers through DCU Online Banking, Mobile Banking, ATMs, Easy Touch Telephone Teller System, the Information Center, or at any DCU branch. Free Auto Rental Collision Damage Waiver – You're covered for collision damage or theft on auto rentals. Optional Overdraft Protection On Your DCU Checking – Overdrafts are automatically charged to your DCU Visa Platinum Credit Card up to your credit limit when you choose this option. Embedded EMV chip to protect your information – DCU Visa® Platinum Secured Credit Cards now come with chip technology built right in. This tiny chip protects your information in a big way. 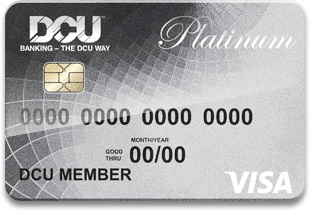 The DCU Visa Platinum is the perfect card for college students. Online access is easy when you're away from home through Online Banking and it is safer than cash. DCU VISA 10.75% to 18.00% when you open your account, based on your credit-worthiness. After that, your APR will vary with the market based on Prime Rate*. DCU Rewards VISA 13.50% to 18.00% when you open your account, based on your credit-worthiness. After that, your APR will vary with the market based on Prime Rate*. DCU Secured VISA 13.75%. After that, your APR will vary with the market based on Prime Rate*. This APR may be applied to your account if you make a late payment. How Long Will the Penalty APR Apply? If your APR is increased for this reason, the Penalty APR will apply until you have made six consecutive payments (minimum or higher) when due, beginning with the first payment due following the effective date of the change. How to Avoid Paying Interest on Purchases Your due date is approximately 25 days after the close of each billing cycle. We will not charge you interest on purchases if you pay your entire balance by the due date each month. How We Will Calculate Your Balance: We use a method called "average daily balance (including new purchases)". * The Prime Rate used to determine your APR is the Prime Rate as published in the Wall Street Journal at the end of the month immediately preceding the start of each billing cycle. Please refer to DCU's VISA Credit Card Agreement and Federal Truth-in-Lending Disclosure Statement. DCU Visa Platinum Secured is rated 4.2 out of 5 by 52. Rated 5 out of 5 by DC27 from Awesome Good customer service great bank to work with very convenient. Rated 5 out of 5 by Shilpa 22 from Excellent services Very quick and easy. Timely response. Excellent services, vast availability. Rated 5 out of 5 by Alan musyoki from Improve credit This is one of the best way to improve your credit !! Rated 5 out of 5 by Thekid0318 from Great tool to help rebuild my credit. Easy to get easy to use. Good tool to help rebuild my credit. Rated 5 out of 5 by frank s. from if you have less than a stellar credit score this is a great product if you have made a few mistakes along the way with your credit. look into this secured card. dcu makes it simple, I applied online and got a reply immediately. the process is quick and easy to understand. included is a chance to build your credit and no annual fee . no annual fee, that's a big benefit. Rated 5 out of 5 by Jose from This product is excellent. DCU platinum visa has one of the lowest interest and I recommend this product to anyone. Rated 5 out of 5 by GDLC from Above and Beyond I was reached by DCU and was given a chance wit their secure credit card. Per the loan officer due to my account directs deposits and long time membership they went ahead and gave me an exception. Typically with creditors you never get that one on one with the reps the lending department, I truly appreciate DCU giving me a chance. I'm in the process of trying to rebuild my credit and this is going to help me greatly. Thank You DCU! Rated 5 out of 5 by lucas&liz from fund your card Everything is pretty straight forward, and the customer service will try, and ask their supervisor, anything to try and help you. Is the account noted as secured when reported to the credit bureaus? Some accounts report as a secured card which I read could impact my credit negatively. Does the DCU secured card report as secured? This account appeared on my credit report as an open credit card account. In fact my credit score increased within 60 days by 36 points after I opened this account. If you are looking to rebuild a positive credit history this is a great start. I live in Pennsylvania and don't have an account with you. Am I able to open an account, fund it, and then apply for a secured card all without being near a branch? I live in Brooklyn, NY and I applied for an secured card from my living room. I was able to write a check to open an account and fund the secured amount requested for my secured Visa card from my lPad. It was fast efficient and I received approval in about 48 hours. Will opening an secured visa and a saving account lower my credit score? My question is basically; is the credit card a soft pull credit card? I want to use this card to rebuild my bad credit. I don't want the credit card inquiry process to lower the score. Definitely yes, it you apply for a secured card, they will in fact make a hard inquiry on your credit history, and most likely it will lower your score and this is a fact. is DCU's report to major credit bureaus reported as a secured credit card? DCU reports this secured Visa account to all three major credit bureaus, however it does NOT report as a &quot;secured&quot; credit card. The account reports as an open credit card account. I hope this helps. Yes you do however the minimum deposit is $5.00. That's a small investment to the benefits of a low APR, no annual fee, and friendly customer service. Good luck! Before you apply, please refer to the Details tab for important information. Apply Online – Most members get an answer on their application while still online. Apply by Phone – Apply 24 hours a day by phone 508.263.6700 or 800.328.8797, (select 3). Any DCU Branch – Visit your local branch to open a Visa Platinum Secured Card today. If you have any questions, please speak with a Member Service Representative at your nearest DCU branch or call our Information Center at 800.328.8797, weekdays from 8:00 a.m. to 9:00 p.m., and Saturdays 9:00 a.m. to 3:00 p.m., Eastern time. DCU secured visa card is very useful and I needed one to build credit. DCU's card has great features and excellent service. StreetWise Guide to Credit and Credit Management – Pertinent information on how to obtain and maintain a good credit rating, credit scoring information, and much more. Calculation of Finance Charges – Learn exactly how finance charges or interest on DCU loan accounts are calculated. DCU Visa Gift Card – The DCU Visa Gift Card is always the perfect gift for any occasion. Mobile Wallets  Enjoy all the benefits of your DCU Debit and Credit cards using Apple Pay, Google Pay, and Samsung Pay. It’s the easy, secure, and private way to pay with a simple touch. Order replacement checks, dispute a transaction, or report fraud – Secure forms, located in Online Banking under Account Manager, allow you to address many items that may arise. Managing and/or avoiding credit card interest – Learn how to reduce or entirely avoid credit card interest. How to report a lost or stolen credit card – If your card has been lost or stolen call DCU immediately. After hours, report lost or stolen Visa Credit or Debit Cards at 800.847.2911. Visa Credit Card Disclosure (.pdf format, 6 pages) – This covers rates, terms, and conditions related to DCU's Visa credit card programs.